September’s back-to-school shopping turned into “back-to-home” shopping, with the DC metro market hitting the highest September sales numbers in 10 years. This shopping spree was for both pending and closed sales. The strong September sales activity topped off a month that also included higher prices and increased inventories, according to the analysis of RealEstate Business Intelligence (RBI). It was a dynamic housing market for both sellers and buyers with the fall season kick off, making not only football fans happy! Closed sales were up 15.5% from last year and highest September level since 2006. New contracts were up 12.5% from last year and highest September level since 2005. Median sales price rose 2.6% to $400,000 – with all property types experiencing increases, with condos taking the lead at 3.5% to $295,000. Inventories increased for the 24th consecutive month, gaining 6.5% in September. New Listings marked the highest level of September listing since 2007. Closed Sales – Tenth consecutive month of year-over-year (YoY) increases. Closed sales were not only the highest September level in 10 years, but also should increases in all property segments for seventh consecutive month, and all jurisdictions enjoyed increased sales compared to last year. Closed sales equaled 4,117 – with detached single-family homes increases YoY the most at 20.3%; condos by 15.2%; and townhomes by 7.3%. New Contracts – Eleventh consecutive month of year-over-year increases. September stats showed the highest level of pending sales in a decade at 4,781. It was the eight consecutive month for all market segments to demonstrate YoY increases, with townhomes with the largest bump at 19.7%; single-family detached homes with a 11/3% increase; and condos with a 8% increase. Townhome contracts were up 6.5% from August. Prices – The September median sales price of $400,000 is $10,000 or a 2.6% increase from last year. 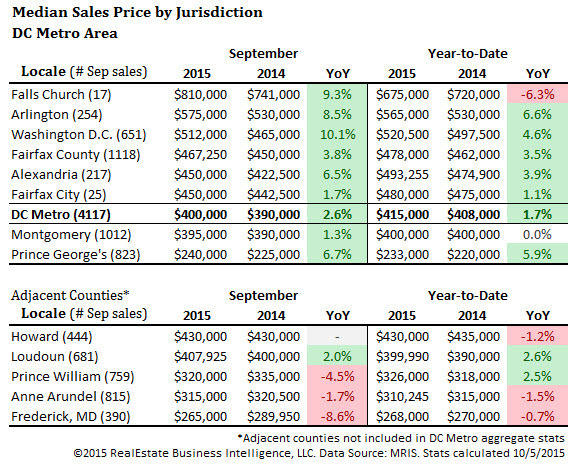 The DC metro area saw its September sales volume hit just above $2 billion, up 19.4% from last year. Median sales prices in the District increased 10.1% to $512,000, leading the region in price growth. Median sales prices in Arlington County rose 8% to $575,000; in Fairfax County 3.8% to $467,250; Alexandria City 6.5% to $450,000; Montgomery County 1.3% to $395,000; and Prince George’s County 6.7% to $240,000. Inventories – The 12,955 active listings represent a 3.2 month supply, leaning toward a seller’s market. Inventories and new listings continue to rise, marking the 24th consecutive month of YoY increases in active listings, and the 10 consecutive month of for YoY new listings. Condo inventory growth took the top at 13.5% to 3,262 listings; townhomes up 7.7% to 2,600 listings; and single-family detached homes up 3.1% at 7,080 listings. Inventories were up 5.1% compared to last month and most jurisdictions experienced an increase except for the District and the City of Falls Church. Median Days on Market – A slight increase to 27 days, up from one day last year and two days from last month. Townhomes have the lowest median DOM at 20 days; condos at 28 days; and single detached home at 31 days. The DC metro area’s real estate market remains very strong for both buyers and sellers! 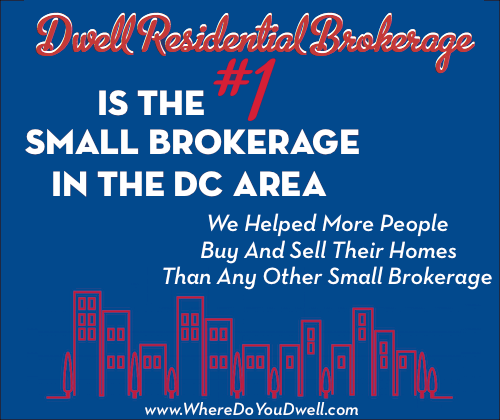 It’s a great time to sell and/or buy a home almost anywhere in and around DC! Woo Hoo!